It was during my teacher training that I first heard about forest school. It was a dark and disquietening time for me as I felt the joy of teaching being sucked out of me and watched as the love of learning ebbed in my six-year-old charges. I knew there had to be another way. Once I discovered there was an alternative, one based in nature and with the sole objective of inspiring discovery and learning, there was no looking back. A decade later and a lot has changed in education, both for better and for worse. When I started and explained the path I had chosen was called ‘forest school’ I was met with blank faces. Nowadays, people’s faces light up and tell me their child/grandchild/niece or nephew ‘does forest school’ but still the understanding is limited. If the traditional, stereotypical model of classroom education is ‘telling’ the learner about facts and ideas, then outdoor education is more about ‘showing’. Take that one step further and forest school is all about ‘guiding’ the learner through ideas, skills and concepts that appeal to them. The aims and objectives that a forest school leader will have in their mind during their sessions is what is usually termed as ‘soft outcomes’ – independence, resilience, wellbeing, social skills, creativity, problem solving and ability to share – which arguably are more important in adult life than our ability to recall our eight times table (never did nail that one). The way this is achieved is by facilitating or allowing our learners to explore, discover and learn new skills within the defined parameters of the forest school. For example, the group I teach on a Friday is in the corner of the field of a Bristol school, with a few trees and an area for fire. I always arrive with a main activity that’s designed to engage them with the natural world and is as open ended as I can make it so that if the mood takes them, they can extend it as much as they like. At the same time, there are always the same activities available; invertebrate investigations, nature soft toys, wooden musical instruments and digging and messy play. The children dip in an out of activities, alternating between creative and imaginative play to more practical skills such as digging and making mud pies (which then get served to unsuspecting teachers and the imaginative play begins again!). At any one point, the children are in charge of their learning, tuning in to whatever seems the most important to them that day. Sometimes I can say exactly what a child has learnt that session and other times I can only guess but I know that learning has definitely happened which was more than I ever could say when I was classroom-bound. We often have a fire. We practice the safety rules every time before we light it. I model the behaviour I want to see and they show me they understand by repeating that behaviour. I light the fire and for a moment they are all spellbound by the awe of the natural world. Suddenly, a couple remember there was something else they wanted to do and skip of to sit in the branches of a tree, others head off to dig holes while a few remain staring into the flames. Some rejoin as others leave and so the ebb and flow of the fire circle continues, always welcomeing, always safe and always magic. The responsibility and calculated risk of being around fire gives the children an understanding of potential dangers as well as providing a guided experience of how to manage those risks. The benefits of increased confidence and feeling of importance that trust brings to a child is invaluable and far outweighs the perceived risks of the fire. As trained professionals, forest school leaders know that the perceived ‘risk’ involved in an activity will always feel greater to those who are taking part than to those of us who have thought through the activity from all angles and put measures in place to make it as safe as possible. The children potter about their important business of learning, sometimes asking for help, sometimes inviting adults to join and sometimes ignoring us completely. But always present and engaged. As the weeks continue, the children notice the changes in the seasons as we come to know each other well. The weekly nature of the sessions means that we can all take our time in getting to know each other and the natural world we’re playing and learning in. the community that is created over time only adds to the sense of safety and belonging for all of us and we all develop and grow together. I could go on. And on and on and on. But for now, I’ll leave it with you. If you’d like more (text book) information then have a look at what the Forest School Association has to say. If any of this has ignited a spark and you think that forest school is for you then get in touch with any questions that you have. Each year I run my award-winning Level 3 Forest School training courses during school holidays, divided into two parts. The first part consists of 5 days and covers all the theory and paperwork skills you will need, plus you begin to master your practical skills as well as playing lots of games and taking part in creative activities. The second part is your 'development days' where you will take part in as many practical activities and learn new skills such as birdsong, woodwork, outdoor cooking, woodland crafts as well as learning how to set up a forest school area and working on your portfolio. I have to tell you that the full name of the qualification is 'AIM Awards Level 3 Certificate in Forest School Programme Leadership' but that's a bit of a mouthful so I tend to shorten it! Tintern is just 40 minutes' drive from Bristol and we will have access to the beautiful gardens, fields and woodlands of the Wye Valley Sculpture Garden, NP16 7NX. 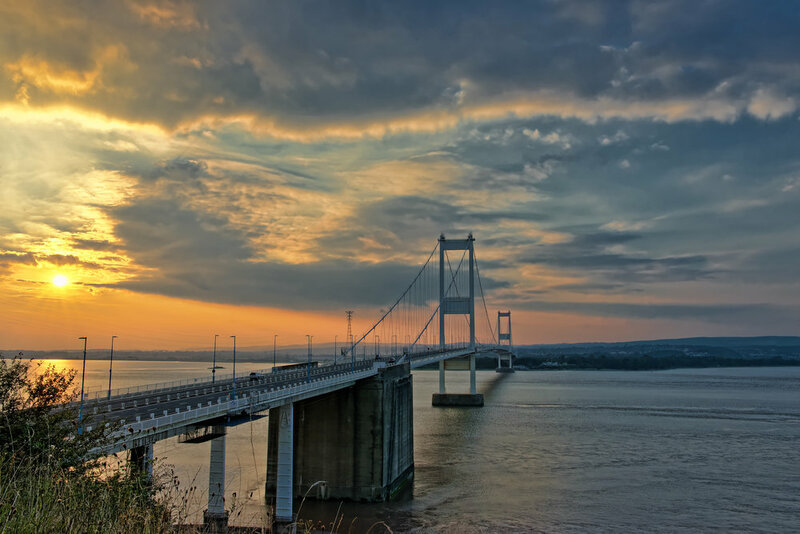 There is no longer a bridge toll on the Severn Bridge so accessing the Wye Valley is even easier. On this course you will learn everything from woodland management, site maintenance and risk assessments, to the safe use of tools, species identification and how to put the forest school ethos into practice. I'll even teach you practical skills such as firelighting, campfire cooking and knifework. The course includes a total of 9 days of tuition and assessment, plus an onsite observation, ongoing tutorial support and will help you to develop a written portfolio of your forest school work. The cost of the course is £900. If you would like to talk to me about payment plans then please get in touch. I am fully committed to making my courses accesible to as many people as possible. If you like reading policies you can read more here, otherwise just drop me an email with any queries you have and I will do my absolute best to accommodate you. Hi! I’m Jackie and Go Wild is my company. Go Wild is an accredited centre in its own right which means that everything is kept in-house from the development of the course curriculum, to assessments and quality control, meaning that you won't find another course or company like Go Wild. I teach every aspect of the course, and I keep any hand in by running my own weekly forest school sessions in a variety of settings. I am a lively and enthusiastic individual, and I use my obvious passion for learning in the outdoors to engage and inspire both children, adults and the occasional dog. On paper, I am a qualified teacher, forest school leader and trainer, an outdoor first-aider, a skilled environmental educator and I have a PGDip in Education. I am one of the few Forest School Association Endorsed Trainers in the UK and the only one in Wales. I have worked for many of Bristol's green institutions including the Avon Gorge and Downs Wildlife Project, Bristol Zoo and the Wild Place Project and so I am uniquely placed to guide you on your forest school journey. If you'd like to know how I ended up creating Go Wild, find out what motivates me by having a look at my blog. When I’m not forest schooling, I can be found in the Wye Valley, generally getting muddy and enjoying the countryside. Throughout your course you will be in contact with me and the rest of the team, as well as your fellow trainees and will benefit from online support material as well as a flexible approach to assessment styles and a personal approach to training. You will need to obtain an outdoor first aid qualification before you can obtain your qualification. This is NOT included in the cost of the course. You may already have a qualification that is sufficient, I am happy to advise about the first aid qualification so please email me to find out more. Please note: Part of the training includes an observation of you teaching a session. For visits to groups within a 20 miles of Bristol or the Forest of Dean, there is no charge for mileage. If greater than 20 miles, there is a charge of 70p per mile. Other arrangements can be made if you live a long way away. This is a very, VERY small part of the course and shouldn't discourage you from signing up. Get in touch to find out more, or if you have any questions. Courses are delivered by Go Wild Education Ltd. and I do not charge VAT. Click on the questions below to see the answers! There are so many trainers out there, why should I train with Go Wild? If you want a personal approach to training then this is the course for you! I have been teaching forest school sessions for over a decade and have a wealth of experience with all ages and abilities. I run a small company and I pride myself on my personal approach. Whether it's a simple question you ask to the closed Facebook Group of trainees, an email to me asking for advice, or access to secret Go Wild events to develop your skills, I am there for you every step of the way. I am a Forest School Association Endorsed Trainer, which means that my training has been scrutinised by the forest school professional body and it has been deemed to pass the very high standards set by the Association. If you want to know what my trainees think of me, have a look at the testimonials at the bottom of the training page. And then of course, there's my 2017 Woodlands Best Course award. I haven't done a Level 1 or Level 2 forest school qualification, do I have to? The good news is no you don't! You can go straight to level 3 so long as you meet the general entry requirements (see below). Have access to a group (not necessarily a school) that you can plan and run 6 Forest School sessions with. Be committed to furthering your own learning with up to 120 hours of study. You don't have to have a DBS check or first aid qualification to start the course but you will need to have both of these in place by the time you qualify in order to get your certificate. When does training take place and how much does it cost? I run at least three courses a year during school holidays: one at Easter, one in the first week of the summer holidays and one during October half term. Have a look at the training page for exact dates. The course begins at 9:00 each morning and we will finish by 5:30pm. Aren't your courses in the middle of nowhere? Your base for training is the Wye Valley Sculpture Garden in Tintern. This is just 40 minutes from Bristol, Gloucester and Cardiff with good access to the M4, M5 and M50. And now there is no bridge toll on the Severn Bridge so it’s cheaper to get here! The nearest train station is Chepstow and there are hourly bus links to Tintern (although they don’t always coincide!). The bus stops right outside the Wye Valley Sculpture Garden. There is also a bus from Bristol to Chepstow. Many of my trainees share lifts to the course and others choose to camp or find a place to stay in the area. I think there's a bit of magic in the trees around here, it's a beautiful part of the British Isles and my trainees find it an inspiring place to train. So much so that they come back time and again (and I often meet them for a catch-up!). Who will be training me? I'm Jackie and I am lively and enthusiastic about forest school! I use my obvious passion for learning in the outdoors to engage and inspire both children, adults and the occasional dog. On paper, I am a qualified teacher, forest school leader and trainer, an outdoor first-aider, a skilled environmental educator and has a PGDip in Education. I have worked for many of Bristol's green institutions including the Avon Gorge and Downs Wildlife Project, Bristol Zoo and the Wild Place Project. I am training to become a Montessori practitioner and in the autumn of 2019, I will begin a Masters in Outdoor Education. When I'm not forest schooling, I can be found in the Wye Valley, generally getting muddy and enjoying the countryside. You will have a total of 9 days of hands-on tuition in the woods, the rest is up to you! Will the course be just focused on teaching school children? No! As well as running our forest school sessions in mainstream schools I specialise in teaching other groups including teenagers at risk of exclusion, children with Special Educational Needs such as speach and language delay, hearing impaired, ADHD, Autism, adults recovering from alcohol misuse and many more. I pass on as much of my knowledge and experience to you as I can and I'm always on-hand to offer advice about your own groups. Is assessment based on a written work, practical skills or observation? You will have to proivde a portfolio of evidence to show that you understand what you have learned on the course and that you're putting it into practice. Usually this is in the form of essay-style writing but I encourage my trainees to use as many innovative methods, such as videos, if that makes it more interesting for you (and me!). I also come along to a forest school session that you run so that I can see you in action. That's how I know you've really got it and I can always offer advice and guidance once we've seen you in the field (or woods!). I usually do this at the end of your training, once you've submitted all your work. I use Dropbox for submission of work. This is an efficient and environnmentally-friendly way of submitting you work and you can see feedback immediately. It also stops Inka, the forest school dog, from getting her grubby paws (and teeth) on all your hard work. If you're not familiar with Dropbox, don't worry! I cover everything you need to know during your training. If you have five people or more who want either level 1 or 3 Forest School training, INSET or twilight session, then I can create a bespoke course for you at a time that suits you. Please email hello@gowildeducation.co.uk with your requirements. The perfect course for forest school leaders. On this 16 hour first aid course you get not one but TWO certificates: a Paediatric First Aid certificate (keeps OFSTED etc. happy) and an Outdoor First Aid certificate (keeps trainers like me happy). Martin from Borderlands First Aid is running the course. I’ve done my outdoor first aid qualification four times now and this one is by far the best I’ve done. We ran one last summer at the Wye Valley Sculpture Garden (I made him do it all outside with only the teeniest time indoors looking at things on a screen!) and it worked so well, Martin has agreed to come back again to run three more courses in 2019. (Martin has attended the first 5 days of my forest school training so that he knows exactly the sort of things you’re likely to encounter). The course is fully accredited by ITC. If you already have a valid paediatric first aid certificate then you may be interested in the Outdoor Top-Up that we’re running. 4 hours of fully accredited outdoor first aid that brings your current qualification up to forest school standards. Accommodation is not included in the price of the course. Although Tintern is just 40 minutes' drive from Bristol, Bath, Cardiff and Gloucester, it's a great opportunity to stay in the beautiful Wye Valley. There are opportunities for camping at nearby Beeches FarmIf you’d like to stay with some of my firends, there’s glamping in Belle tents or cabins, most of which are on the same site as the Sculpture Garden and Kingstone Brewery. There is also dormitory accommodation available at Camp Hillcrest, and various places on AirBnB, I recommend Copper Beech Cabin (at the Sculpture Garden), Birch Cottage and Hill Farm.